"Right Now" is the debut single by English girl group Atomic Kitten, from their debut album of the same name (2000). The 2004 Greatest Hits album featured a new re-recorded version titled "Right Now 2004", which proved a greater international chart success. The song was written by Atomic Kitten founders Andy McCluskey and Stuart Kershaw – both erstwhile members of electronic band Orchestral Manoeuvres in the Dark (OMD). There are two different videos to accompany the song: one for the original 1999 single release, which opens with workmen assembling the tiled dancefloor inside the studio. It shows all the girls walking through Liverpool wearing wet and shiny jackets, in a baker's shop, down in a lift in a department store, getting in a car, and on an open top double decker bus. This video includes the shots of Natasha, Liz and Kerry in 3 tunnels at a time (red and blue). During the first chorus, the Kittens and dancers dance on the multi-coloured tiled dancefloor with holes to the tunnels, with radio speakers at the side, and a green ramp. The video accompanying the 2004 rerecording shows Natasha, Liz and Jenny rehearsing and performing a concert, intercut with backstage footage and glimpses of press conferences, holidays and television appearances. The single was released in November 1999. "Right Now" stayed in the British charts for 11 weeks, and subsequently sold 122,539 copies, becoming their sixth-best selling single in the United Kingdom. In Belgium, the song was a success, reaching the top 20 and peaking at 17. It secured a place in the charts for 8 weeks. In Oceania, the song was not as successful, peaking at 40 in New Zealand, and 72 in Australia. In 2004, as Atomic Kitten decided to take a break, they released one more single to say goodbye. It was the double-A side "Someone like Me/Right Now 2004". The remix is exclusive on the group's 2004 Greatest Hits album. While the original version was a 1990s disco pop song, the 2004 version is morewas more in the vein of early 2000s dance songs. "Right Now 2004" is featured in the American film Aquamarine. "Someone like Me/Right Now 2004" achieved a better position in the UK Singles Chart than the original release of "Right Now", peaking at number 8. However, it did not sell as many copies, managing to sell 50,000 copies in the UK compared to the original release's 120,000. The song reached the top 20 in Ireland. In the rest of Europe, the song failed to reach the top 40, which is thought to be due to low promotion. It was their lowest charting single in Germany, only managing a peak of number 67, and also in Switzerland, peaking at number 42. In the Netherlands, it was their second lowest charting single, just behind "Love Doesn't Have to Hurt". ^ a b "Atomic Kitten: Artist Chart History". Official Charts Company. Retrieved 17 November 2016. ^ a b "Ultratop.be – Atomic Kitten – Right Now" (in Dutch). Ultratop 50. Retrieved 17 November 2016. ^ a b "Charts.nz – Atomic Kitten – Right Now". 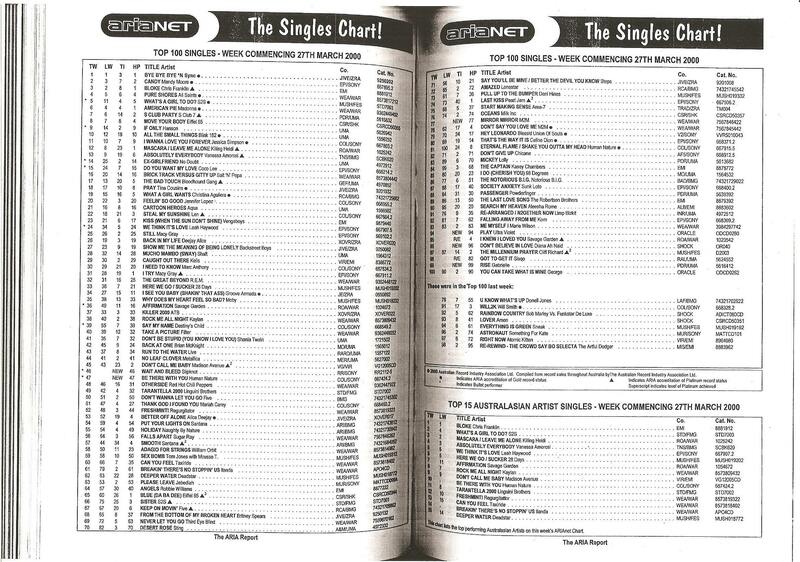 Top 40 Singles. Retrieved 17 November 2016. ^ a b "ariaNET The Singles Chart! – Week Commencing 27th March 2000". Imgur.com (original document published by ARIA). Retrieved 18 December 2017. N.B. The HP column displays the highest peak reached. ^ "The ARIA Report Issue No. 612 – Week Commencing 19th November 2001" (PDF). Pandora Archive (original document published by ARIA). p. 4. Archived from the original on 21 February 2002. Retrieved 19 December 2017. CS1 maint: BOT: original-url status unknown (link) N.B. The HP column displays the highest peak reached. ^ a b "The Irish Charts – Search Results – Right Now 2004". Irish Singles Chart. Retrieved 17 November 2016. ^ a b "Offiziellecharts.de – Atomic Kitten – Right Now 2004 / Someone Like Me". GfK Entertainment Charts. Retrieved 17 November 2016. ^ a b "Swisscharts.com – Atomic Kitten – Right Now 2004 / Someone Like Me". Swiss Singles Chart. Retrieved 17 November 2016. ^ a b "Dutchcharts.nl – Atomic Kitten – Right Now 2004 / Someone Like Me" (in Dutch). Single Top 100. Retrieved 17 November 2016. ^ "Ultratop.be – Atomic Kitten – Right Now 2004 / Someone Like Me" (in Dutch). Ultratip. Retrieved 17 November 2016. ^ "Archívum – Slágerlisták – MAHASZ" (in Hungarian). Rádiós Top 40 játszási lista. Magyar Hanglemezkiadók Szövetsége. Retrieved 8 December 2010. This page was last edited on 21 March 2019, at 11:28 (UTC).